The statistics of the first 100 days of this weblog showed Cafe 101 Section as the most viewed. While I have not made any addition to it since the start of this site, the data showed that visitors continuously browsed the section. It could have been due to their desire to know more about café business. I must say that the whole blogsite is a knowledge base for i-café owners. As much as I could, I post topics about the business on a daily basis. Topics about regulations, business opportunities and technical matters as well as news and announcements about the industry are the contents of this weblog. You have to visit regularly to get informed and comment on each topic that I have here. 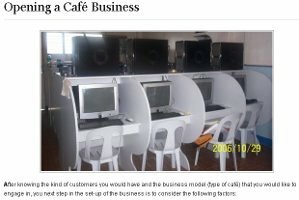 Café 101 is a section of this weblog where I intend to put some information on planning, organizing, leading and controlling your i-café business. However, it would not suffice that you visit just this site and know the ins and outs of the industry. You have to read the various blog articles already published on this site. It would also do us well if you could put your queries and comments at the end of each article. Today, I have added “Opening a Café Business” at I-Café 101. It contains information on various factors that you must have considered when you enter the i-café business. It did not give the specific variables of each factor but it would make a good guide for would-be café owners. You may click the link or the image on this blog to get to the new page and may you enjoy reading it. Your response to the article is welcome.